Selena | The Freedom Diaries. I was introduced to Selena Quintinalla by my cousin a couple of weeks ago and I couldn’t believe I knew nothing of her until I saw the film ‘Selena’ which features Jennifer Lopez. I was amazed and touched by her story and she was a huge star who impacted on many people’s lives, including my own since watching this film and researching Selena’s life. I’m not sure if I’m the only one who was out of the loop and didn’t know about Selena until now so for those of you that know her, you will know her story. Selena was a Mexican-American singer who started singing at the tender age of 3. Her dad discovered she had really good pitch in her voice when she was 9. She recorded her first album at 14! What an accomplishment at such a young age. She was in a band with her brother and sister but Selena was the true star of the show because of her amazing voice. She sang in Spanish but she never knew how to speak it initially so she learned it and taught herself phonetically. Selena wasn’t popular in the beginning because of the dominating world of male Mexican singers and no one thought that she could be as good, if not better than them because of being female. It took a lot for her and the band to get to the brink of stardom but they did it! SELENA did it. She became so popular that she was seen as the Spanish version of Madonna by the Hispanic community and was known as ‘Queen of Tejano’. She met her true love Chris Perez through her brother Abraham (Abi as Selena’s family called him) and was hired by Selena’s father to be a guitarist for the band. Selena and Chris fell in love and became inseparable although once her father found out about their relationship, he didn’t approve of it in the beginning but soon accepted them once the two got married on April 2, 1992. From what I’ve seen in the film and through research on You Tube and the Internet, Selena and Chris were such a cute couple and in every photo I’ve seen of them you can really tell that they were so in love and that their relationship was real. Selena won many awards, one including ‘Best Female Vocalist’ in 1987 and her albums were really popular in the charts, 7 of her hits made it to number one! She had such raw talent and her voice captured many. She was in the process of making her English album in 1995 and was scheduled to release it that Summer. Sadly, it would be Selena’s last year to perform and she would never get to finish the album that would have sold millions all over the world. On March 31st 1995, which was only 2 days from Selena’s third wedding anniversary with Chris and almost a month before her 24th birthday Selena was shot and killed by her manager and so called friend known as Yolanda Saldivar. To cut a long story short, Selena’s family discovered that she was embezzling money from Selena’s fame and fortune and Selena had met up with her to discuss missing financial papers. Selena had no reason to believe that her life was in any danger. Unfortunately though, her giving and trusting nature got the better of her. The ending of her life was so tragic and not simply because it was a death in general, but because Selena was on the verge of becoming a mega star, she had a beautiful marriage with someone who loved her unconditionally, she made plans to have children, she was a modest, kind person and she died at such a young age, too young to be taken away. The film and her story affected me and I was and still am, saddened by her death. Selena was such a beautiful, gorgeous person but not only on the outside, but on the inside as well. She visited schools and stressed the importance of education and from what I researched she was a giving, caring, loving person who opened her heart to everyone. In an interview with Chris Perez that I watched, it was mentioned that Selena would always continue to be open to people and this worried Chris because it made her vulnerable. Nonetheless, it’s what made Selena such a beautiful person. I never knew her when was alive and rising to fame but through the film, her story and her music I have really grown to love her. I’ve seen videos of her concerts, in particular ‘The Last Concert’ which was Selena’s last time to perform before she died. She had a lot of energy and she knew how to work an audience. She was a natural performer and loved her fans. I love the fact that she was just herself and that when she walked off stage at her last concert and was driven away, she waved to her fans the whole time until she disappeared into the distance. She was a beautiful person, always smiling, always happy. I like her music, both her Spanish and English songs. My favourite is ‘Dreaming of you’. It has a really nice tune and melody. I heard it on the radio today and it always makes me cry when I hear it because Selena was so beautiful with such an amazing gift and she died so tragically and could not live to continue her music and become an even bigger star than she already was. She didn’t deserve to die in such a way. It was also the ending song to the film showing pictures and video clips of the real Selena and it plays during the scene when the family find out Selena died. It was so sad, especially seeing the way Chris (the actor in this instance) was affected. Seeing his reaction and thinking that’s how the real Chris Perez felt and how he had been affected by losing the love of his life made me cry so much. It angers me that a person could do such a thing to someone who was so kind and from discovering from the film, gave Yolanda anything she asked for. Selena put all her trust into this woman and was betrayed by her. Her death had a huge impact on her fans and it was breaking news, interrupting TV programs. 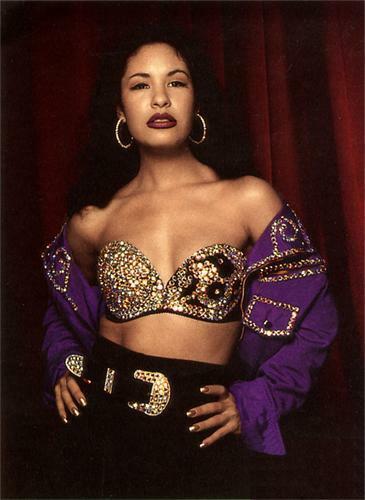 Her music played continually on Texas radio, where she was from and People magazine dedicated an issue to Selena that sold over thousands of copies. Her legacy still lives on and for those that loved her, she will never be forgotten. She inspires me to discover your dreams and make them come true and she’s made me realise that anything is possible and that you can be anyone you want to be if you really strive for it. I wish she was still around because I know she would be such a huge success and she’d live to have a family with Chris and make her other lifelong dreams with him come true. Selena, I never knew you when you were alive but finding out about you and your life has had a huge impact on me and has made me really love you and the amazing music you created. May you forever R.I.P.